There’s no question that iRobot and Shark are two brands that have taken the market of robotic vacuum cleaners by storm. Although both of them are popular for their efficient robotic vacuums, iRobot has been in the manufacturing or robotic vacuums much longer than Shark while Shark produces a broader range of vacuums. For this reason, it can be a daunting task for you to tell which one is better among the two. And that’s why I came up with this in-depth comparison. In this comparison, we are going to look at shark ion robot vs. Roomba review in details including features, usability, design, warranty, battery power, and much more. Stay tuned. Shark ion robot vs. Roomba: Which is better? Should you buy the shark ion robot 750? Should you buy the irobot Roomba 690? As you’ll see in the review below, Roomba 690 is our clear winner. It is more efficient than shark robot 750 and runs 10 minutes more than shark 750. Roomba 690 also requires a shorter time to recharge its battery. Both the Roomba and Shark have sensors that assist the cleaners in avoiding drop-offs in places like stairs and obstacles like furniture. What’s more with Roomba 690 is that it have an extra feature which pinpoints spots of highly concentrated dirt, just like a human! This sounds fabulous….right? Why should you buy a robotic vacuum cleaner? According to a study published by Science Direct, robotic vacuum cleaners have become very popular because of their efficiency and they are quickly replacing humans in our day-to-day cleaning chores. As a result, hundreds of millions of robotic vacuum cleaners have been bought to date. Shark ion 750 is manufactured by a renowned brand and is one of the newest types of robot vacuums available in the market. This vacuum comes with excellent features as discussed below. To start with, you can seamlessly begin or schedule cleaning from anywhere, anytime with the vacuum’s app on your Smartphone. Shark ion comes with a self-cleaning brush roll that captures long and short hair, allergens, dander, and dust to prevent their buildup in your house. Its smart sensor navigation navigates seamlessly on carpets and floors. The innovative tool also has proximity sensors which assess and adapt to the surrounding obstacles. The dual side spinning brushes pull in debris from all edges and corners. The next-generation tool comes with a long-life lithium-ion battery which allows for over a whopping hour of cleaning time. You can also control this robotic vacuum by voice if you have Amazon Echo or Google Home. You can start or schedule to clean wherever you are using a Smartphone App. Comes with a magnetic tape that zones off unwanted areas. Have a voice control feature and functions with Google Home and Amazon Alexa. More silent compared to Roomba 690. Less suction power in comparison to Roomba. Some users say that the robot loses the Wi-Fi connection. Shorter run time of 70 min unsuitable for large homes. 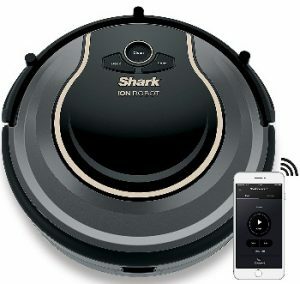 Whether you have carpeted floors, hardwood floors, or a mixture of both, shark ion robot 750 is innovatively designed to handle transitions between all the floor types effortlessly. It comes with a running time of a whopping 70 minutes depending on the floor type, which is typically more than enough to vacuum an average floor size. The vacuum features a tangle-free kind of rotary brush on the vacuum’s base and two spinning side brushes that sweep off dust and debris into the bin. Overall, the vacuum works the way you want and in the most efficient way. Roomba 690 is one of the newest versions of robot vacuums recently released from iRobot. The upgraded version comes with great features as we are about to see. Like shark ion, you can seamlessly start or schedule cleaning from anywhere, anytime with its App. However, the iRobot HOME App is only compatible with Google Assistant and Amazon Alexa. The highly advanced vacuum cleaner comes with a Dual Multi-Surface Brushes and one of its kind 3-stage cleaning system which picks up everything from large debris to small particles. Its dirt-detect sensors inform the cleaner to work immensely harder on concentrated areas of dust like the high-traffic areas of your home. It also comes with a full suite of inventive, intelligent sensors, which guide the cleaner around and under furniture to assist clean your floors thoroughly. With auto-adjust cleaning head, Roomba can automatically adapt a new height to clean hard floors and carpets efficiently. You can control the cleaner with smartphone iRobot HOME App. Features central Dual multisurface brushes to loosen dust and the other brush to pick the dust-up. Dirt Detect sensors enable the robot cleaner to work incredibly harder on highly concentrated dirt areas. Compatible with Google Assistant and Amazon Alexa and features a voice-activated control. No path planning and mapping feature; moves randomly. Have a runtime of 60 min only which is unsuitable for a large house. Have a smaller dust bin capacity compared to the other robot cleaners. If you are an adventurous kind of person like I’m, and you would like to give the wonders which the modern technology have to offer, irobot Roomba 690 is your perfect match. The significant advantage of this cleaner is its compact size, combined with excellent levels of flexibility and power. Forget about being within the vicinity to operate it. Forget about using a remote control. Its reasonable price will enable you to start becoming familiar with robotic products. Now that we have looked at the shark ion robot 750 review and Roomba 690 review face on, and head to head, let’s now see who is the clear winner between the two in different product features categories. This will enable you to make your buying decision faster. Stay tuned. If you have carpeted floors, hardwood floors, or a mixture of both, shark ion robot 750 may be your best bet. It is innovatively designed to handle transitions between all the floor types effortlessly, and this is a great feature. More excitingly, it comes with a running time of a whopping 70 minutes depending on the floor type, which is typically more than enough to vacuum an average floor size. The vacuum cleaner also features a tangle-free kind of rotary brush on the vacuum’s base and two spinning side brushes that sweep off dust and debris into the bin. Have carpeted floors, hardwood floors, or a mixture of both. If you want an excellent cleaning device without breaking your bank, Roomba 690 may be your perfect choice. It is highly user-friendly because of Wi-Fi connectivity, and the cleaning performance is up to the par. Included virtual wall, low maintenance costs, and ability to start or program cleanings remotely are excellent features of this robotic cleaner. On the downside, this cleaner may struggle cleaning large apartments and homes that have many rooms. Have a small to medium size home. Tight on budget and you’re looking for higher value for your money. Shark robot has two side brushes and one rotary brush. On the other hand, Roomba 690 has one side brush situated conveniently at 27-degree angle and two rotating brushes. Shark robot 750 weighs 5.5 pounds while Roomba 690 weighs 7.8 pounds. Roomba 690 runs for 70 min while Shark robot 750 runs for 60 min. Roomba 690 requires a shorter time to recharge its battery. Roomba is recharged in 120 minutes while Shark ion robot 750 is charged within 180 minutes. They both feature removable bins. All debris captured go straight into the containers while a filter traps fine dirt. The removable bins make the work of dumping the contents easier. Both the Roomba and Shark have sensors that assist the cleaners to avoid drop-offs in places like stairs and obstacles like furniture. What’s more with Roomba 690 is that it have an extra feature which pinpoints areas of highly concentrated dirt. According to an article in Digital Journal, most people want a robotic cleaner which is as close to humans as possible. This feature makes Roomba 690 more popular. As you’ve seen in the above-detailed comparison, Roomba 690 is a clear winner. I loved it because it proved to be more efficient than shark robot 750. To start with, it runs 10 minutes longer than shark 750 which is a useful feature especially if you have a larger room. Roomba 690 also requires a shorter time to recharge its battery, and when recharged, it stays longer before the next recharge. It is, therefore, a great time saver wherever you want to do things in a rush. Even though both the Roomba and Shark have sensors that assist the cleaners in avoiding drop-offs in places like stairs and obstacles like furniture, Roomba 690 comes with an extra feature. The innovative feature pinpoints locations of highly concentrated dirt. This helps to ensure that even the dirtiest area is left clean just like you would have done. 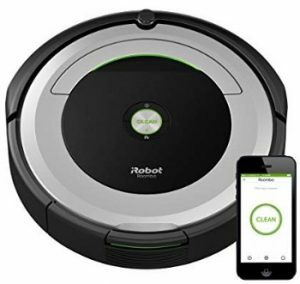 So, if you are looking for a robotic cleaner that will work as close to a human being as possible, Roomba 690 is certainly your best bet. Have an exciting buying experience.